Recently retired after more than 30 years in practice, the family physician, obesity medicine expert, educator and advocate has had a career full of accomplishments—but remembers the special moments along the way. After residency, Dr. Isensee began full-spectrum practice at Dean Medical Center, delivering babies and caring for generations of families. She also served as Dean Medical Center’s chair of recruiting and the site chief for its West Madison Family Clinic. In 1993, she was the first woman elected to Dean Clinic’s Board of Directors. As Dr. Isensee’s leadership roles grew, she stopped doing deliveries, but several years later, a surgeon colleague she trained with in medical school contacted her about caring for patients who experience metabolic changes after bariatric surgery. In 2005, Dr. Isensee and her colleagues established the Dean Comprehensive Weight Management Program; she was the medical director until 2013. As one of Wisconsin’s few physicians certified in obesity medicine, Dr. Isensee also served on the Obesity Medicine Association’s Curriculum and Advocacy Committee, and lobbied for the Treat and Reduce Obesity Act sponsored by Wisconsin Representative Ron Kind. In 2016, she began her newest role: president of the Wisconsin Medical Alumni Association (WMAA). Although Dr. Isensee’s term as WMAA president ends in July, she’ll continue on its board of directors as a past-president for four more years. 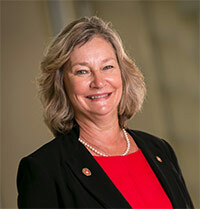 For her, that work is service to the University of Wisconsin School of Medicine and Public Health, which provided the education that made her career possible. Recalling learning experiences that changed her life, Dr. Isensee remembers a rural rotation as a fourth-year medical student with Dr. Eugene Krohn, founder of the Krohn Clinic—one of Wisconsin’s first rural group practices. Dr. Krohn was Dr. Isensee’s family physician while growing up in the rural town of Melrose, Wisconsin. He not only taught her obstetrics skills, but took her kayaking and blueberry picking around Black River Falls. Those experiences and her rural upbringing led Dr. Isensee to choose a residency at the University of Wisconsin Department of Family Medicine and Community Health. She was based at the Madison program’s Verona Clinic, and considers William Scheibel, MD, and Baldwin Lloyd, MD, her biggest mentors. One of her most memorable experiences was a rural rotation in Waupaca. She lived there for two months, went sturgeon fishing and made maple syrup with the preceptor and staff, and took emergency department call every other night. One night, she went to the scene of a bad accident, and accompanied the patient and the emergency medical technicians as the only physician on the ambulance ride to Appleton.